More products, fewer platforms | What Car? At the moment almost every Jaguar Land Rover is built on its own, bespoke platform. Phil Hodgkinson, director of product development for Jaguar Land Rover, says the company has nine products on eight platforms, which is a really expensive way to produce cars. Companies such as Ford have promised 10 products off the Focus platform, and Hodgkinson says this is the direction that Jaguar Land Rover will have to take. 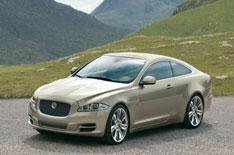 One example of getting more out of a platform is the XJ coupe artist's impression you see here. Again it's not confirmed, but it's just the sort of platform spin-off that other manufacturers are up to and that can create more profit at relatively little expense.